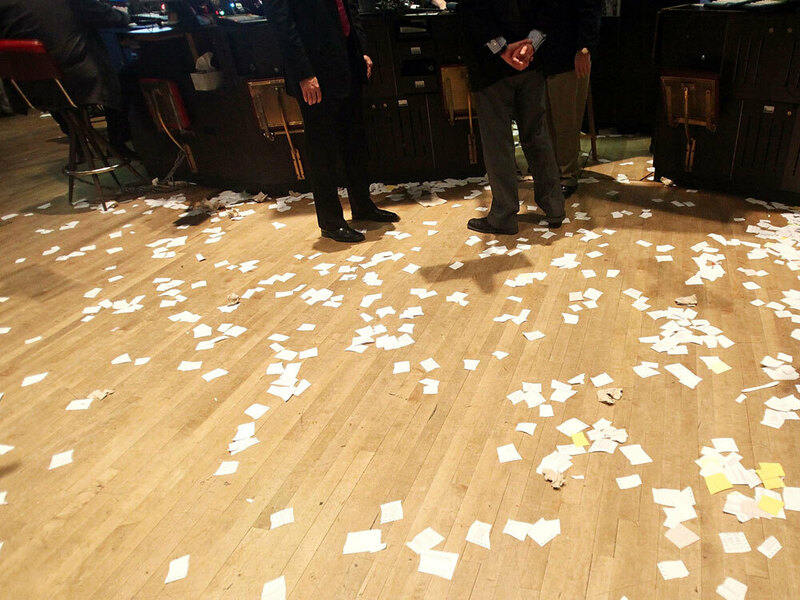 Traders work on the floor of the New York Stock Exchange on Dec. 16. As the world celebrated the start of a new millennium 10 years ago, Wall Street too had plenty of reasons to party: The dot-com boom had driven technology stocks to phenomenal highs, and the rest of the market wasn't doing so badly, either. All in all, the future looked bright. Intel, Yahoo and Amazon were still young technology companies a decade ago, but they were also components in an amazing machine that had been churning out money with abandon. The tech-heavy NASDAQ composite index had risen by 80 percent in 1999. But the tech boom would collapse with the 2000-01 recession, and a lot of the more tenuous dot-com companies would follow, proving that things like revenue and profits really did matter after all. The tech sector would recover soon enough, but a lot of investors had to watch the mirage of illusory stock gains fade away. The Sept. 11, 2001, attacks were a personal tragedy for a lot of Wall Street firms — companies like American Express, Merrill Lynch and Morgan Stanley had offices in or near the World Trade Center — but they were also intended to strike a blow at one of the symbolic centers of the U.S. financial industry. In the aftermath of the attacks, the New York Stock Exchange remained closed for nearly a week, and stocks would fall sharply, but they would gradually rebound. With the decline in stock prices, a lot of companies that had relied on accounting tricks to make their books look good were suddenly exposed as frauds. It was an extraordinary event in the sense that so much was forgotten so soon. The first to go was the once-lionized Houston energy-trading firm Enron; it would be followed by WorldCom, Adelphia Communications, Global Crossing and others. The scandals dealt a big blow to the credibility of Wall Street. Analysts and rating agencies that had lavished praise on these companies turned out to be as much in the dark as anyone else about what was happening. Congress would pass laws forcing publicly traded companies to be much more transparent about their dealing. But once again, Wall Street would prove its resilience. "It was an extraordinary event in the sense that so much was forgotten so soon. The speculative fervor intensified as we went through this past decade," says economist Henry Kaufman. To keep the economy going, the Federal Reserve kept interest rates at historically low levels. At the same time, financial deregulation had freed large financial institutions to borrow recklessly and experiment with new kinds of investments, Kaufman says. What followed was a remarkable era of loose credit. Suddenly it was ridiculously easy to get a credit card, refinance a mortgage or even build a shopping center. In the economic boom that followed, unemployment fell, the price of oil and other commodities soared, and real estate frenzy gripped states like Florida, Nevada and Arizona. By October 2007, the Dow Jones industrial average hit an all-time high of 14,164. But as housing prices started to fall again, banks and hedge funds that had invested in mortgages took a huge hit. In September 2008, financial giants like AIG, Lehman Brothers and Merrill Lynch were either seized by the federal government or shut down altogether. Credit dried up, dealing a blow to the global economy that the world is still recovering from. By last March, the Dow Jones industrial average had lost more than half its value. Now that the markets… are starting to move back up, people are going to see the potential for profit and that greed part of the equation does come into play. The Fed and the Treasury Department responded with a series of highly controversial taxpayer-funded bailouts of some of the firms that were hardest hit by the downturn, including Fannie Mae and Freddie Mac, General Motors and major banks like Citigroup and Bank of America. Today, the markets have stabilized, and stock prices have enjoyed one of their best years in a long time. But the wild swings of the past few years have left a lot of investors chastened and have given them a new sense of just how risky the markets can be. Once, it was conventional wisdom that the markets would always go up over time, and that stocks represented the best investment, if you could only ride out the downturns. The notion of buy-and-hold investing has been discredited somewhat, says Bernie McSherry, senior vice president of strategic initiatives at Cuttone & Co. But the markets have traditionally bounced between fear and greed, and as stocks recover, so too will people's faith in the markets, McSherry says. "Now that the markets ... are starting to move back up, people are going to see the potential for profit, and that greed part of the equation does come into play," he says. "People will start to step back into the markets. It's been going on for hundreds of years, and it's in the nature of markets."